If you plotted a 5 period simple moving average on a 1-hour chart, you would add up the closing prices for the last 5 hours, and then divide that number by 5. Voila! You have the average closing price over the last five hours! 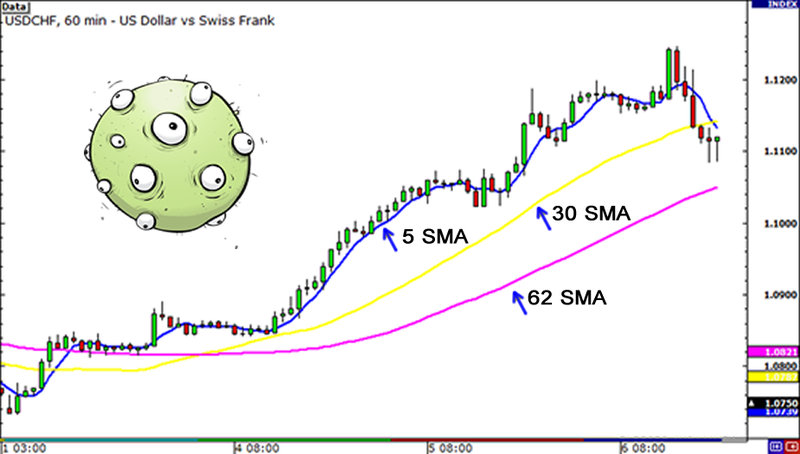 String those average prices together and you get a moving average! You have the average closing price over the last five hours! String those average prices together and you get a moving average! If you were to plot a 5 period simple moving average on a 30-minute chart, you would add up the closing prices of the last 150 minutes and then divide that number by 5. In the next lesson, we will show you what we mean, and also introduce you to another type of moving average to avoid this problem.